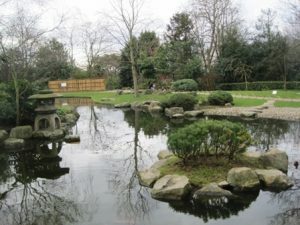 Holland Park is a comfortably sized park of approximately 22 hectares in the west of London, it lies between Kensington High Street to the south and Holland Park Avenue to the north. The park has a peaceful atmosphere and is relaxing to walk through. At its centre is the Jacobean Holland House, the terrace of which is used for theatrical and operatic productions in the summer. The north of the park is predominately informal woodland, Holland Walklies to the east of the house and formal gardens to the west including the exquisite and tranquil Japanese Kyoto Garden. This is set around a pool in which large Koi carp swim and which is fed by a waterfall. A circular path leads around the pool and at the entrance a sign advises: take a clockwise route as the movement of change in Yi is usually perceived in a clockwise direction, if you follow this tradition you will discover the many facets of the garden in the manner intended. The park also contains an orangery, tennis courts, sculptures and a cricket pitch It is home to rabbits, peacocks and parrots among other wildlife.